"Every occupant in the Western world, every stock exchange uses Linux daily," Zemlin began his talk, "whether it is in a Google search or a mobile phone." After 18 years of existence, Linux is ubiquitous, Zemlin reported. He continued by supporting his assertion with facts: 2,700,000 lines of code went into the 2009 kernel. Ninety percent of the kernel authors work primarily on the Linux core, which has long since lost amateur project status. It would cost a company $10.8 billion to build a Linux kernel from scratch, while Linux firms are already earning $50 billion annually in the enterprise market. After 18 years of existence, Linux is ubiquitous, Zemlin reported. Zemlin mentioned three trends that would ensure Linux's further success. First, Linux saves money, which is a major competitive advantage during the world financial crisis. Second, the platform is compatible with every new class of device where a mobile phone and computer converge. 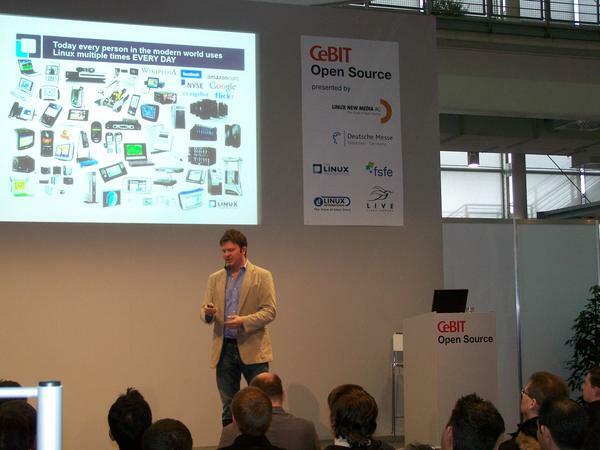 The Linux Foundation is already active with Intel and Nokia in this respect on the MeeGo project. Televisions, e-book readers, and digital photo frames are also candidates for Linux platforms. The third factor favoring Linux is the market move away from products to services. SaaS runs on Linux and open source software. Google runs on Linux. Mobile operators profit from their services, with customers getting the phone or netbook as a bonus, thanks to Linux without its licensing fees. Next to presenting this generally positive future outlook, Zemlin also identified some challenges that Linux must face. As always, these include Linux's standardization that would guarantee interoperability. One way to address this is through the Linux Standard Base (LSB) internal to the Linux Foundation. The second factor is the ongoing legal adversity. "In the U.S.," said Zemlin, "patents are a catastrophe. Too much is patented." Here common legal defense has been active in the form of organizations such as the Software Freedom Law Center and the Linux Legal Defense Fund. Lastly, the world of free software needs to learn a bit from Apple to make its products more user-friendly and fine-tune their outward appearance. The software ought to be "free and fabulous." How to support all this? Zemlin naturally suggested becoming a member of the Linux Foundation.